Rental hut, 4 people. Approx. 30 m2. Telephone +358 20 69 2424. 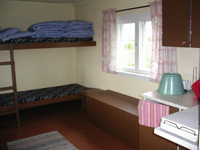 The hut can be booked between 15 May–1 October, no bookings accepted in winter. The hut, which was built from a former fish-salting room, is located in the Bothnian Bay National Park in a former fishing base on the southern end of Selkä-Sarvi Island. Southern Lapland, City of Kemi (www.kemi.fi), Bothnian Bay National Park. 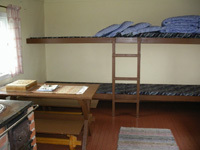 50 € / night (price incl. VAT 10%). Collect and return the keys at the Kemi Gemstone Gallery or at the HaparandaTornio Tourist Office. The keys are not delivered by post. A wood-burning stove, a gas cooker, crockery. There is a sauna at the excursion harbour, which is at a distance of 1 km at the northern end of the island. Please note that it takes some time before the hut is properly warm. Please do not leave any litter or other traces of your stay. Read more about hiking without littering. You must bring your own drinking water. The water in the yard's well is not to be used. There is an open wilderness hut and some buildings from the fishing base in the vicinity. Metsähallitus, Parks & Wildlife Finland. Further information from the Liminka Bay Visitor Centre tel 0206 39 6059. Read the terms of reservation.